I am sending along the Call for Papers for the next Italian American Studies Association’s annual conference (formerly, American Italian Historical Association), to be held in Long Beach, California, hosted by California State University Long Beach’s George Graziadio Center for Italian Studies under the leadership of Dr. Clorinda Donato. As you peruse the Call and the many suggested themes, and as you ponder especially the four highlighted adjectives ("Recorded, Reported, Projected, and Pixilated”), let me ask that you think a bit outside the box and, perhaps, think of antonyms, so to speak, and consider how Italian Americans are seen, or NOT, by Italian cultural hegemonies. As for my own experience, as someone who migrates regularly between both Italian and Italian diaspora studies, I offer up the following as food for thought as well as an invitation to think differently. As we know, Italian-American studies does not enjoy the favorable positioning one might think it does (or should) within Italian studies (especially when conceived within the mid-set of italianistica) both inside and outside of Italy. A decade ago the American studies journal in Italy, Àcoma, dedicated a special issue to the theme, “L’America che leggiamo: saggi e aggiornamenti,” with no reference at all to any U.S. writer of Italian descent, not to mention the notion of any semblance of a thematics we might call Italian-American literature. This, notwithstanding the aesthetic positioning of John Fante in Italy, or the cultural/literary history of the United States with the likes of — Yes, it is a long list of many, not all, whom we should surely know. — Helen Bartolini, Mary Jo Bona, Grace Cavalieri, John Ciardi, Peter Covino, Don DeLillo, Rachel Guido deVries, Emanuel di Pasquale, Louise DeSalvo, W. S. DiPiero, Louisa Ermelino, Gil Fagiani, Maria Famà, Lawrence Ferlinghetti, Mario Fratti, Fred Gardaphe, Dana Gioia, Daniela Gioseffi, Maria Mazziotti Gillan, George Guida, Gerry La Femina, Annie Rachel Lanzillotto, Frank Lentricchia, Maria Lisella, Paul Mariani, Donna Masini, Stephen Massimilla, Fred Misurella, Joey Nicoletti, Jay Parini, Joseph Ricapito, Nicole Santalucia, Felix Stefanie, Maria Terrone, Lewis Turco, Joseph Tusiani, Anthony Valerio, Pasquale Verdicchio, Richard Vetere, Robert Viscusi, Arturo Vivante, Frances Winwar, and so on. Or, better still, there are those who have and continue to write poetry and/or fiction in Italian and live in the U.S.: Luigi Ballerini, Emanuel Carnevali, Peter Carravetta, Alessandro Carrera, Tiziana Rinaldi Castro, Giovanni Cecchetti, Ned Condini, Alfredo de Palchi, Rita Dinale, Franco Ferrucci, Luigi Fontanella, Arturo Giovannetti, Ernesto Livorni, Irene Marchegiani, Mario Moroni, Pier Maria Pasinetti, Emanuele Pettener, Mario Pietralunga, Giose Rimanelli, Annalisa Saccà, Victoria Surliuga, and Paolo Valesio are some of the names that come to mind in this regard. Fortunately, let me add as I continue, contrary to the above-cited Americanist journal in Italy, the Italian studies journal, Studi italiani, housed at the Università degli Studi di Firenze and edited by Gino Tellini, launched last year the section “Oltreconfine,” which is dedicated to the Italian diasporic voice outside Italy, especially that voice articulated in Italian. 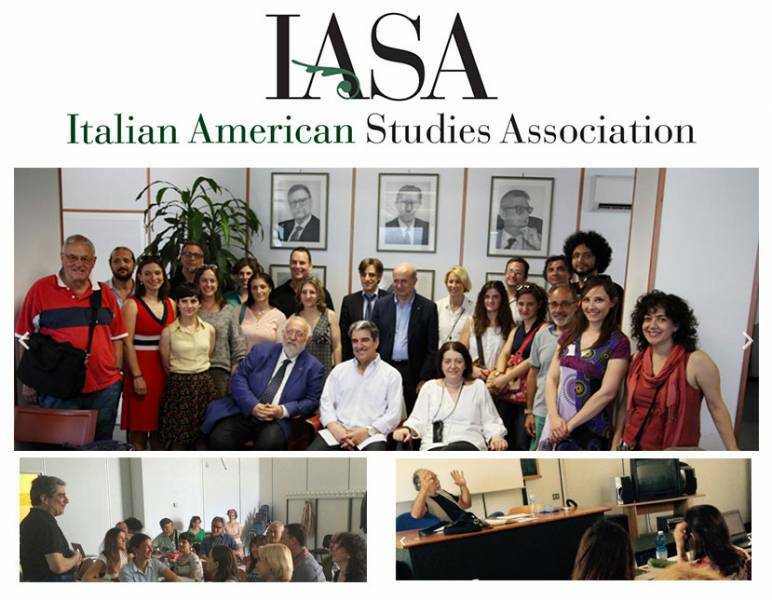 Then, at the AISNA (Association Italiana di Studi Nord Americani) biannual conference at the Università degli Studi di Napoli L’Orientale last September 2015, the Association dedicated a plenary session to the volume, Transcending Borders, Bridging Gaps: Italian Americana, Diasporic Studies, and the University Curriculum, a collection of essays that originated from a four-day workshop at the Rockefeller Foundation Center in Bellagio, Italy. So, surely, Spes ultima sea! Things are looking up! The session is open to any and all notions of and/or discourses on the aesthetic with regard to the relationship, or lack thereof, between Italy and the many Italian diasporas. Submissions should include author’s complete name and email address, a title, a 300-word abstract, and a brief description (150 wds. max.) of the author’s work with regard to any form of an Italian diaspora. I am especially interested in submissions of presentations that will prove to be intellectually stimulating, provocative, and, in the end, notably productive with regard to a greater strategy for the inclusion of Italian diaspora studies within the university curriculum both here in the United States and in Italy. Send all submissions and inquiries electronically to the following email address: [email protected]. The deadline for complete submissions is no later than February 19, 2016. Music, theater, film, multi-media, mass media and advertising, publishing, artistic renderings, science and technology, and the burgeoning digital humanities have characterized and are changing the way Italian Americans conceive of themselves and how they re-conceptualize and re-signify their identities. In recognition of this powerful moment in the representation of ethnic American identities, the Italian American Studies Association is calling for contributions from scholars and writers in every field for its 2016 annual conference. Fittingly slated for a California venue where Hollywood and the Silicon Valley have led the charge in forming our media-driven lives, the conference will take place at California State University, Long Beach, November 3-5, 2016. We invite full panels or individual papers as well as digital short films, digital projects, digital art, digital presentations, and creative writing. Presenters are limited to presenting one paper/presentation of scholarship and one creative writing reading or one creative panel or scholarly presentation and one chair position. Presentations are limited to 15-20 minutes based on the number of people in a panel. If you are willing to serve as a chair, please indicate that willingness in your cover letter. Please send us a brief one paragraph bio with your credentials and your abstract of 100-250 words detailing your thesis and indicating what type of presentation you will be presenting: a traditional scholarly paper, multi-media presentation (PowerPoint or Prezi), short film or digital artifact, digital art, original creative writing. Please note that the selection of panels will be a more competitive process than the selection of individual presentations. · Italian American representation on Youtube, blogs, MEMEs, and Vine, and other digital/ media platforms. · Analysis of Italian-American political figures. · The politics of co-opting and marketing Italian-American language, posturing, culture, and/or stereotypes for politics or products for political gain. · Italian American communication styles and patterns in social linguistics. · Exploring one of these topics through digital short film, documentary short, or other multi-media project including creative writing.